A relaxing read that takes you on an informative journey of inner peace toward eternal happiness. Why Mindfulness is better than Chocolate by David Michie is a book that draws you in from the first time you lay your eyes on the cover to the moment you close the book. A love for chocolate and it’s ability to heal all woes is one that is well known worldwide and was my initial attraction to this book. The use of a slightly unwrapped chocolate bar, which teases the senses before your reading journey even begins, is the initial draw card. Within it’s content David Michie cleverly relates to chocolate, but it is soon evident that this book is about way more than chocolate as the reader is taken on a inner journey of peace and self exploration. “We’re at our happiest when our mind is not wandering - that is, when we’re in a state of mindfulness. The highlight of my mindfulness seminars is often an exercise I call ‘the Lindt technique’ where I invite participants to mindfully enjoy a Lindt chocolate. From opening the foil wrapper, to savouring the smooth, liquid heart of the chocolate as it bursts in the mouth. For two or three minutes a blissful silence ensues. 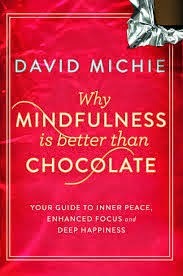 Mindfulness applied to eating of chocolate” - David Michie. David Michie draws on ancient Buddhist teachings and contemporary science, providing a book that meets modern day and brings one to the place they are comfortable being during their own meditation sessions. From the beginner to the more advanced meditator David Michie mixes light humour with an easy to understand explanation, allowing one to progress through the book whilst enhancing not only their knowledge but their mindfulness skills. As a beginner who runs a busy daily schedule with little time to breath I found Why Mindfulness is better than Chocolate a breath of fresh air. David Michie bought me back to reality. He showed me how important it was to find my state of mindfulness. To find just that moment each day for my own happiness and inner peace. He provided me with an easy to understand explanation of what mindfulness really is. The definition of mindfulness was one I found differed greatly between my friends and co workers based on their experience and understanding of the concept. David Michie put it all into perspective, giving ten easy steps that enabled me to get into the meditation habit regardless of my daily schedule. Yes I am still a mindfulness beginner but with David Michie and Why Mindfulness is better than Chocolate by my side I am well and truly on my way to finding the inner peace, enhanced focus and deep happiness that I truly deserve.